Apple confirms new iPod touch and iPod nano | What Hi-Fi? Apple has launched "a new line-up of the world's most popular music players" with the announcement of a new iPod touch and a new iPod nano. The iPod touch (below) is from £249, while the new iPod nano (right) is just £129 for a 16GB model. Available in five colours, the iPod touch features a 4in Retina display, the A5 dual-core chip, AirPlay mirroring to your TV, integrated voice control from Siri and the latest Apple iOS 6 operating system. 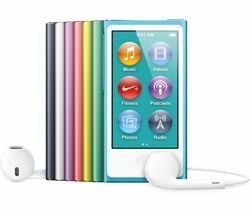 The new iPod nano meanwhile introduces Bluetooth streaming, a 2.5in multitouch screen and an FM radio with pause and rewind functionality. Both come with the new Lightning connector that is smaller than the existing Apple dock connection and means that you will need a new adaptor, shipping at the same time, in order to connect to existing iPod speaker docks (the same as on the iPhone 5). The new touch and nano will also ship with the new Apple EarPods, which feature a new design and claim a better fit and crucially better sound. It's the thinnest ever iPod touch, measuring just 6mm thin and weighing 88g. It now has a 5mp camera with 1080p video recording and an LED flash for photos. There's also iMessage, FaceTime, a new look Mail app, Game Centre and more. The new iPod touch battery life delivers 40 hours of audio playback and 8 hours of video playback. Would you believe the iPod nano is the thinnest ever, too? At 5mm, it's true. A larger display than the last-gen nano, it promises to make navigating your music better with a multitouch screen and a new home button. Bluetooth is integrated, though no sign of aptX, and there's a 30-hour battery life for music or 3.5 for video. A pedometer and support for Nike+ is built-in, too. It comes in a choice of seven colours. Both the new iPod touch and the new iPod nano will both be available to pre-order from Friday 14th September.